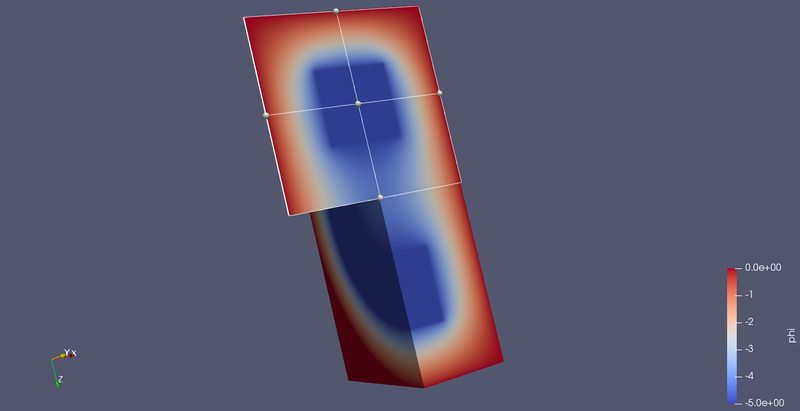 Are there known accuracy issues between 2D axisymmetric and 3D solutions? In my full 3D solutions I am solving for the potential throughout a $100\times 200\times 200$ grid. 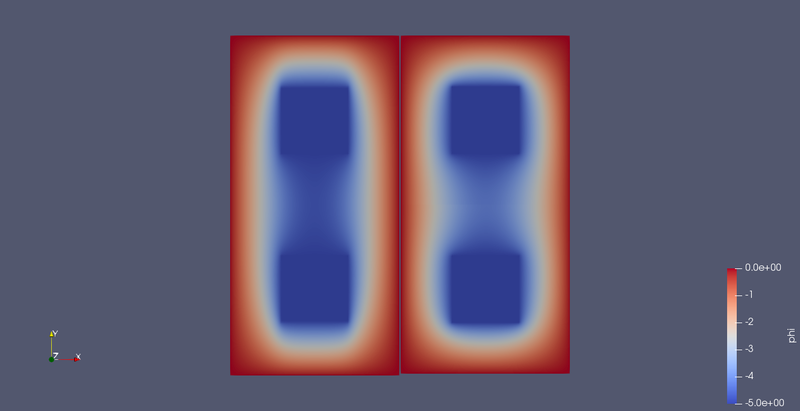 Inside is a ring electrode set to -5V via a Dirichlet boundary condition, and surrounded on all sides by Dirichlet boundary conditions at 0V. When I solved for this setup in full 3D vs solving for the same setup in 2D axisymmetric form, I get different results. In the images below, one can denote the darker blue color, in the very center of each of the two solutions. For the 2D axisymmetric setup, the left, top, and right all have the same 0V Dirichlet boundaries as the 3D setup except for the Neumann boundary on the bottom where the axis of symmetry for the problem resides. Below you can see two images. In both images, the object on the left side is a 'slice' of the 3D solution, and the object(s) on the right is the solution for the 2D axisymmetric solution. 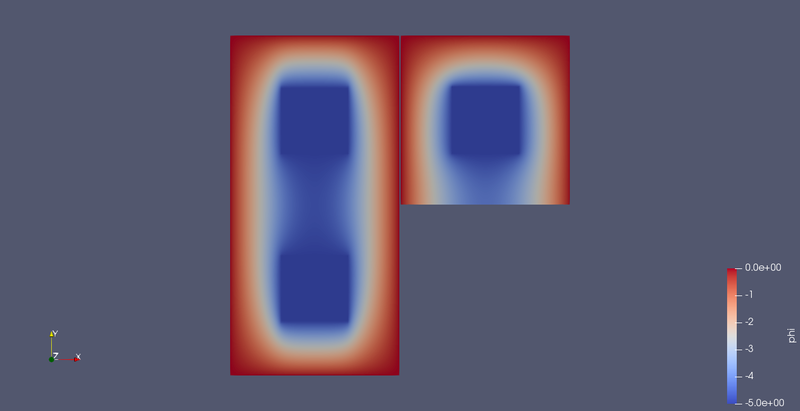 The first image shows the 2D axisymmetric solution, whereas the second image has a 'mirror' image of that solution placed just below its counterpart, to make comparing the two solutions (3D vs 2D axisymmetric) that much easier to see. So, is it in any way common for such a marked difference in the results of 3D vs 2D axisymmetric results for elliptic PDEs? UPDATE: I would like to thank Bill and Wolfgang for their constructive questions. Knowing that the 2D Axisymmetric and 3D solutions should be the same, I modified my 3D setup and used a $100\times199\times199$ grid instead, with $(i, 99, 99)$ as the axis for the ring electrode, and setting Dirichlet boundaries at a radius of $100$ from said axis. 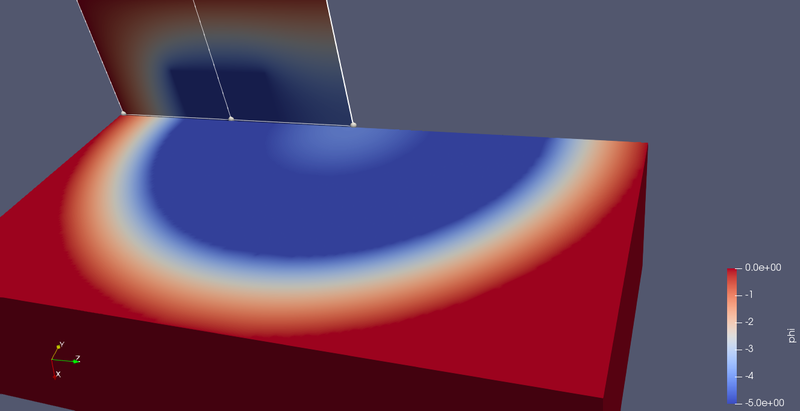 The solutions in 3D now match my 2D axisymmetric solution. Below are the images showing the now matching solutions. Browse other questions tagged boundary-conditions numerical-modelling elliptic-pde or ask your own question.